This is the bust I was referring to in my previous post. Veiled Lady by Bazzanti resides in the Bankfield Museum in England. 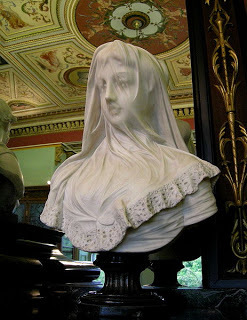 I think this is an amazing piece, you can feel the sheerness of the veil but it’s stone. The problem of depicting an object or person beneath sheer material is fascinating. I think you have to think of it as a whole, not as two separate things. Many years ago when I was in college I used to stand by a stream that ran through the lower campus of BYU. I was mesmerized by the moving water. I could see the surface of the stream, the reflections, the bottom, everything all at once and the question was how would I paint that. It was an intellectual pursuit really, because I never set up an easel by that stream to tackle the problem. So the Bizzanti piece, the stream, “The Couch” piece, and “Boxes” are kind of dealing with the same thing. I think I need to go back to that stream again, but this time armed with paint.